I wanted to make a body cream using Shea Butter that followed the KISS method (Keep it simple, Sue). I enjoy using body creams that feel nice on the skin and yet don’t require extra applications as the day progresses. This body cream was the result of my formulating. Let’s take a peek at the ingredients that I chose!Shea Butter: For several years, I have seen lotions and creams advertised as using Shea Butter in their ingredients. I wanted to see if I could make a light body cream while using Shea Butter, or if I should use Liquid Shea Oil. I was happy to discover I didn’t need to change from using the Refined Shea Butter. Peach Kernel Oil: I had originally formulated this recipe using Apricot Kernel Oil but since I don’t have any in my recently filled work cupboards, I decided to use my newest favorite oil instead. Peach Kernel helped contribute to the light feeling of the body cream. 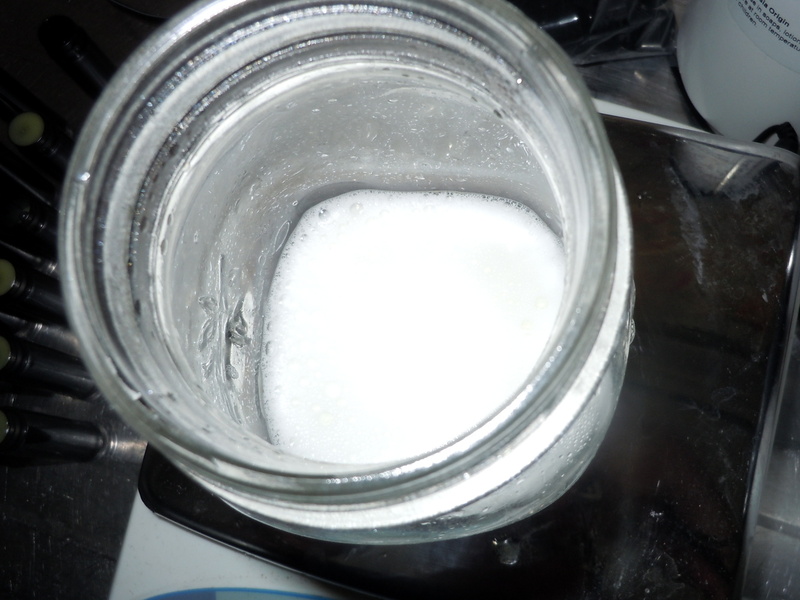 Emulsifying Wax: Since I wasn’t planning on making an anhydrous body butter, I needed something to help the oil and water bond. Emulsifying Wax was just the thing! HoneyQuat: I could have easily used any humectant, but I decided on using HoneyQuat for the simple reason of needing more recipes using it! HoneyQuat helped with the long-term moisturizing feel of this body cream. 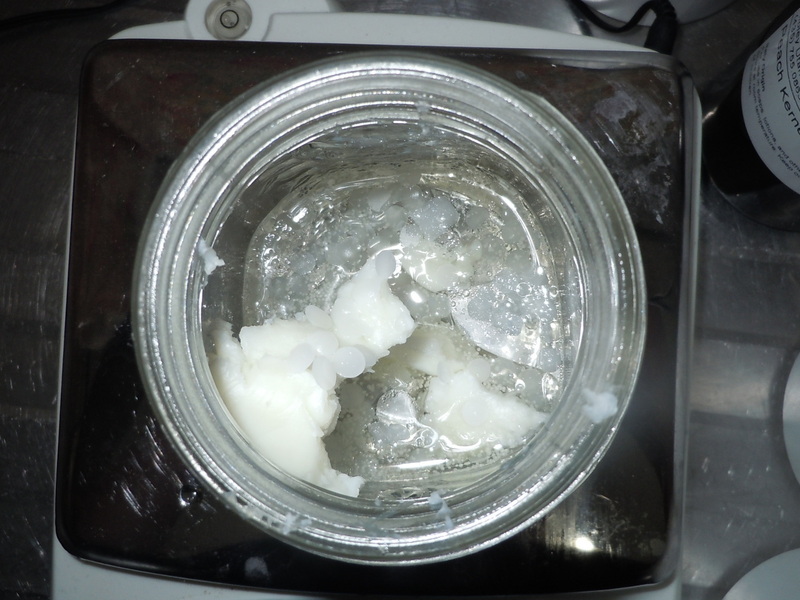 Stearic Acid: I wanted to have a thicker cream, so I used Stearic Acid as a thickener for the lotion as I knew the Shea Butter wouldn’t be enough to make a thick lotion. Liquid Germall Plus: Liquid Germall Plus is one of my go-to preservatives because it has a low required usage rate. (Which means money saved!) It also is compatible with most cosmetic ingredients so I don’t have to worry as much about a failed preservative. 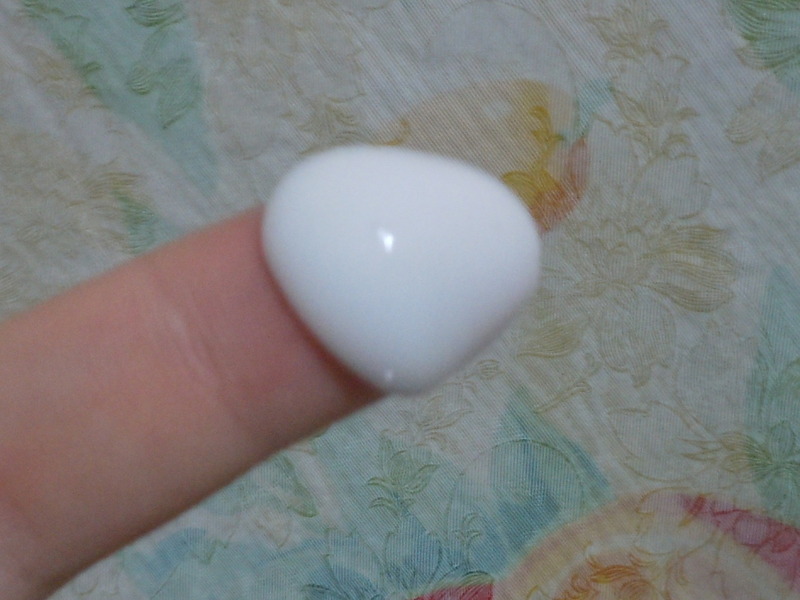 Cooled body cream on my finger. Natural Vanilla Oil: Now the holiday season is in full swing, I find myself dreaming about foodie scents. Scenting this cream gives a light vanilla scent that makes me wishing for pie and vanilla bean ice cream. Weigh all ingredients except the additives (Natural Vanilla Oil and Liquid Germall Plus Preservative) into a microwave safe container. Heat in the microwave using short time bursts until everything is melted. Blend the ingredients to a smooth, creamy consistency using the immersion blender. Add the additives once the temperature drops to approximately 120° F in the mixing bucket. Stir gently until completely mixed. Pour into jars and allow to cool completely before labeling. Cream Notes: This is a nice and light body cream. It absorbs easily and leaves skin feeling silky. There is a slight drag that allows the skin to be briefly massaged while being applied and allows one to quickly pamper oneself. If over used, will take a few minutes for the fingertips to not feel slick. That being said, you can easily apply and go back to work without leaving an oily residue on everything! As the normal process of soapmaking produces glycerin. I don’t think the addition of another humectant is necessary, especially since soap is a wash-off product, not a leave-on product. Honeyquat is probably better used in products and leave-on products. I’m going to try this, looks nice. Back to the old order form! Love your cream notes about it not being overly oily! I have some creams I only use at nighttime since they take longer to absorb into the skin, but this one sounds perfect for work. Great recipe I have a bunch of shea butter that I’d like to experiment with. I can figure it out for myself, but I thought you should know that the recipe in ounces shows percentages. Yikes! I’ve fixed this recipe now! Thanks for your help.